Work: David McCracken began sculpting in his teens, mostly figurative work carved in wood. Returning to Auckland in his early twenties he worked in a variety of jobs including boat building and construction and gained skills using fibre and later steel fabrication and welding. He became involved in performing arts and in a short time was working full time in the production of sets and props. At this time he began making sculpture using a wide variety of materials. McCracken saw the potential of steel fabrication for producing art from readily available and inexpensive scrap when he could afford little else. He also experimented using a variety of materials including river rocks, synthetic hair and found objects. He furthered his metal fabrication skills to include aluminium, stainless steel and corten steel, and began casting in bronze and stainless steel. 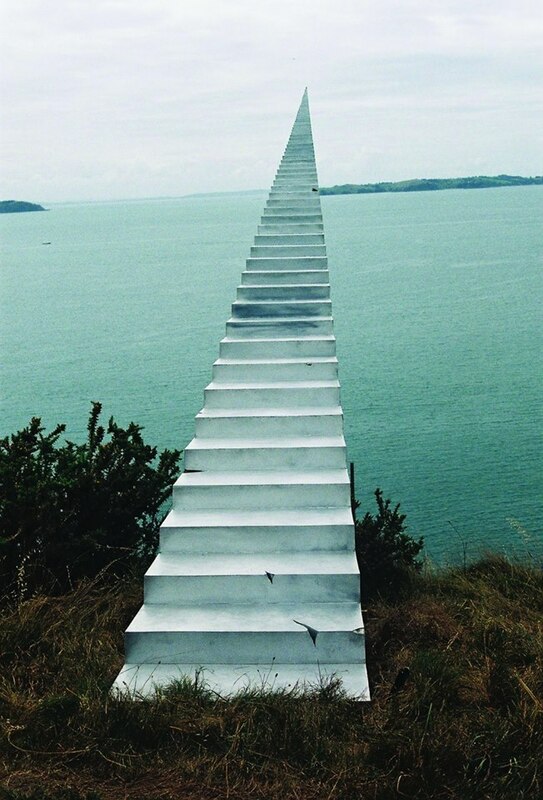 In 2000 he had his first solo exhibition ‘Fabrications’ at the McPherson Gallery and exhibited at the Beecroft outdoor sculpture show, marking the beginning of a series of floating works. In 2001 he was short listed for the Wallace Awards and had a second show ‘H2O2’ at McPherson Gallery as well as some private commissions. Work slowed for a spell after the birth of his third child in 2002 but in 2003 he increased production and is now sculpting full time. McCracken has exhibited at many outdoor exhibitions including three Sculpture in the Gulfs, winning the People’s Choice award in 2005, and Shapeshifter exhibitions. He has been short listed for the Wallace Awards three times, being an award finalist twice. Wanganui’s growing reputation as a thriving arts centre gained more weight yesterday with the installation of a new sculpture on the riverfront. The sculpture, crafted by New Zealand artist David McCracken, is a large, polished stainless-steel sphere with a fissure denoting the Whanganui River cutting through it. Mr McCracken is an Auckland-based artist, who began sculpting in his teens. His early work was mainly figurative wood carving. Mr McCracken has shown work at many outdoor exhibitions including three times at Sculpture in the Gulf, winning the People’s Choice award in 2005, and Shapeshifter exhibitions. He has been shortlisted for the Wallace Awards three times, being an award finalist twice. Wanganui Mayor Annette Main yesterday paid tribute to those involved with bringing the sculpture to fruition. “The McCracken sculpture has been several years from planning to construction, and the artist and the generous donor, who wishes to remain anonymous, have been working closely with the council and Whanganui Iwi representatives to ensure a sensitive placement of the work was achieved. “It is a wonderful new addition to the growing collection of public artworks displayed along our riverfront area, which includes ‘Balancing Act’ and ‘Kereru’, acquired as part of Sculpture Wanganui 2010. David McCracken began sculpting in his teens, mostly figurative work carved in wood. After a period in the performing arts he began making sculpture using a wide variety of materials. McCracken saw the potential of steel fabrication for producing art from readily available and inexpensive scrap when he could afford little else. He furthered his metal fabrication skills to include aluminium, stainless steel and corten steel, and began casting in bronze and stainless steel.